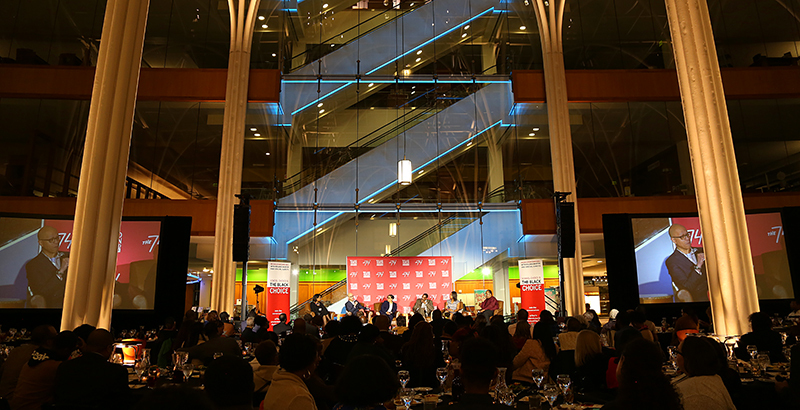 At a packed event Sunday evening at the Indianapolis Public Library, journalist Roland Martin asked tough questions of local school leaders about education, equity, and America’s persistent achievement gap between students of different races. The event, “School Choice Is the Black Choice: Indianapolis,” marked the first education town hall in what will be a national series of such events, engaging black families on issues of student achievement, parent involvement, and classroom equity. The tour is being organized in conjunction with The 74’s newest website, Keeping It 100, which prioritizes stories, profiles, and essays about how schools across the country are serving students and families of color. Hundreds turned out for the Sunday town hall in Indiana, where Martin pressed local education leaders to reflect on teacher diversity, school discipline, and parent engagement. Throughout the night, Martin stressed the need for education advocates to work together to create change through school choice. Panelists included education consultant George Parker; Derrell Bradford, executive vice president of 50CAN; Candace Pate, director of admissions and community partnerships at Providence Cristo Rey High School in Indianapolis; Aleesia Johnson, Indianapolis Public Schools deputy superintendent for academics; and Kelli Marshall, CEO of Tindley Accelerated Schools. Panelists also weighed in on union politics, equity, and school discipline. After hearing about Indianapolis’s system of traditional district schools, innovation network schools, and charter schools, Martin pressed the panelists to think about how they can change a “convoluted” system. The event brought together more than 300 local educators, parents, and advocates. You can learn more about the national tour right here; register to get the latest “School Choice Is the Black Choice” coverage delivered straight to your inbox by signing up for The 74 Newsletter.